Orange is a versatile fruit and can be easily used in different types of desserts and sweet dishes. Today, we're going to use it with poppy seeds for making a light and delicious cake. Poppy seeds provide the crunch and complement the spongy texture very well. You can either use orange juice concentrate or fresh orange juice for the flavoring. If you're using concentrate, quantity will be almost half than the latter. One can easily prepare the simplified version of this cake omitting the orange flavoring altogether. You can keep this cake for up to 2 to 3 days depending on the climate. If it's damp and hot, consume it much earlier. So prepare your oven and get ready to make this simple cake recipe. 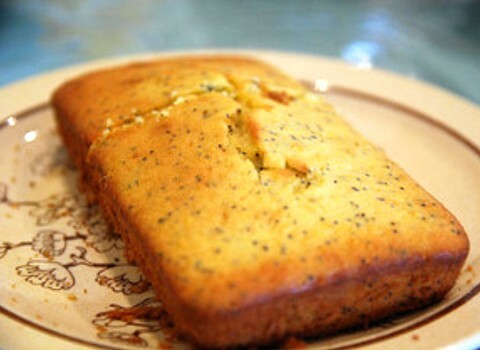 Enjoy this light, fluffy, tangy and delicious cake recipe consisting of fresh orange juice as well as crunchy poppy seeds you can relish at your tea time. Dry roast poppy seeds in a pan for about 30 seconds and keep aside. Break all the eggs in a big bowl and whip them briskly for about 3 to 4 minutes. Add sugar and continue beating till the egg and sugar base turns fluffy. Sift wheat flour, baking powder and salt. Slowly add egg and sugar base and continuously stir ensuring it's mixed well. Melt butter and add that too in the cake dough base. Follow it with slowly adding milk and continue stirring for about 4 to 5 minutes. In the end, add orange juice and once stir again till the dough reaches the right consistency. Finally add lightly roasted poppy seeds and give it another whip. Pour the cake dough base in a greased baking tin and let it settle down for about 5 minutes. Bake in a preheated oven at 325 degrees for about 20 to 25 minutes. Let it cool down to the room temperature and slice in your desired shape before serving.